Now in its 16th year, the annual Amsterdam Dance Event is firmly established as the leading convention of its kind. Over five days, the movers and shakers in the electronic music scene meet, greet, discuss and of course, party, at what is now classed as the world’s premiere clubbing festival and conference. Central to ADE’s success and worldwide appeal are its parties, and the annual MN2S event has consistently brought some of the globe’s biggest DJs together at one of Amsterdam’s finest clubbing institutions. Last year’s event featured a crop of house DJs in the form of David Morales, Quentin Harris and Phil Asher and this year MN2S present a line-up made up of the scene’s forefathers who are coming together to celebrate 25 years of one of house music’s most iconic brands, Def Mix. Def Mix defines what house music is all about and the continued success of its catalogue and artists is a true testament to its status. 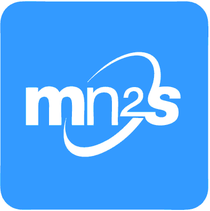 MN2S team up with Def Mix for this special occasion. 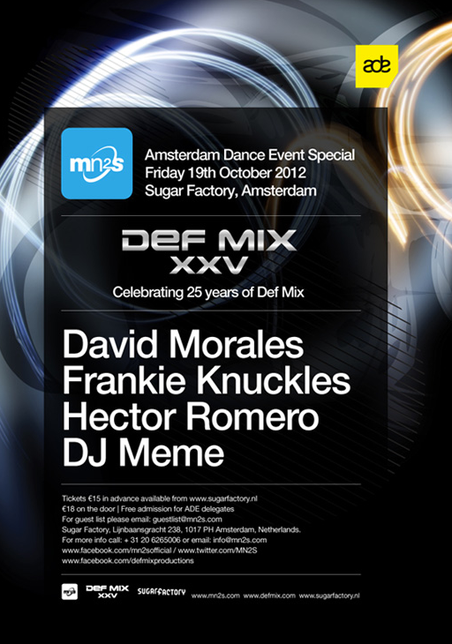 To mark its silver anniversary, David Morales joins Frankie Knuckles for an ADE exclusive date at Sugar Factory. Completing the line-up is Hector Romero and DJ Meme.